This little circus elephant and baby bib in a little case make a great gift for a boy — send them to someone little you love. This gorgeous elephant soft toy is part of Steiff's new Little Circus collection and is perfect for little hands to hold. It has a blue patterned print and is squeezably soft and light to carry. Together with the soft baby bib, they make an irresistible present to send on news of a new baby boy. 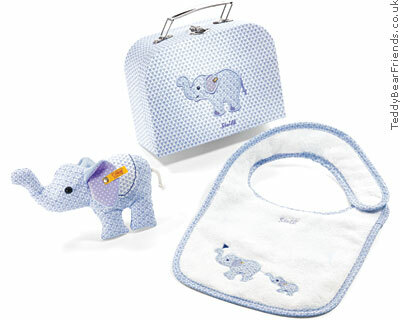 The set comes in a little carry case that is beautifully decorated and will be loved by little ones. And for girls there is a similar gift set from Steiff Little Circus Giraffe Gift Set in Case. Steiff soft toys are just what you need to make your precious little baby feel loved and cared for. As one of the world's premier toy makers, you will be assured that this product is made from materials of the highest quality. A lovely gift idea to mark a special moment.